Fleurs et fruits was probably painted by Van den Eeckhoudt towards the end of his fauviste period, which came directly after WWI, in 1919. It is executed as a series of areas of intense, flat colour, which he had learned from the Nabis, and from Matisse; but already the composition and the more sombre background are beginning to show the influence of Cézanne. The reverse of the canvas has an earlier, more fauviste study of a vase of scarlet flowers, probably poppies, which has been blocked in with charcoal and partially painted. Perhaps this study was left for so long that the poppy season had finished; so Van den Eeckhoudt economically restretched the canvas and moved onto a more amenable arrangement of pink and cream roses in a jade-coloured vase, against which the richly saturated reds, yellows, purple and coral of the fruit glow like stained glass. The flat, decorative pattern created by this technique is undercut by the sense of spatial recession in the composition, producing an effect of tension and vibrancy. A label on the stretcher gives the artist’s address, and a pencil note adds, ‘cadre ancien’ – antique frame. He was an anxious and tormented man, who finally committed suicide rather than endure failing health and a disabled old age. 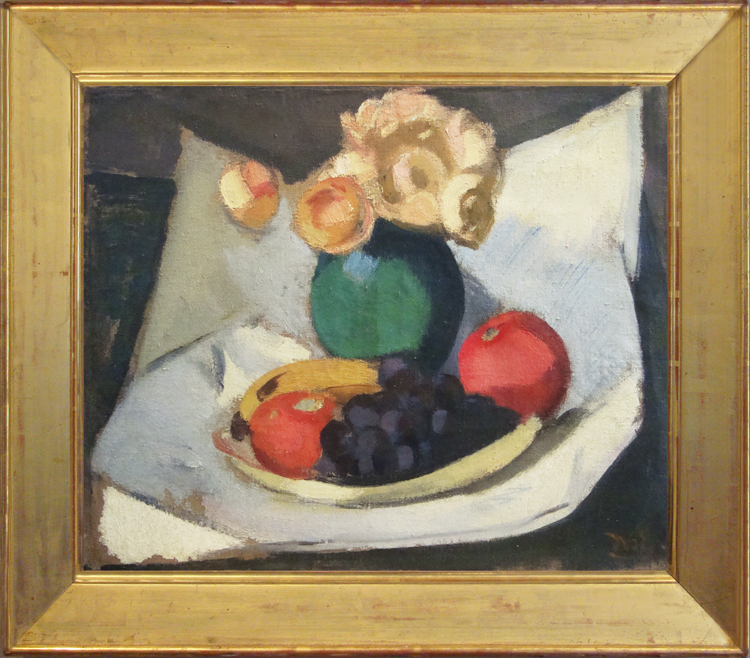 However, little of this appears in his work, much of which is full of Mediterranean sunshine, light and colour, culled from his surroundings in Menton and Roquebrune – on the Côte a’Azure just east of Monaco – where he spent most of his life. Works in public collections include Under the orange tree, or The terrace at les Pâquerettes, 1908, Indianapolis Museum of Art; Portrait of Jeanne Van den Eeckhoudt, the artist’s wife, 1934, A seated woman, c.1942-44, Self-portrait, 1943, The artist’s studio, 1939, and The straw hat, 1914, all in the Musée Royaux des Beaux-Arts, Antwerp.